For the last four days I have been experiencing a great learning conference for educators. The International Society for Technology in Education Conference, ISTE, is held once a year. This year some 22,000 educators and 5,000 exhibitors came together in Philadelphia at The Pennsylvania Convention Center. I experienced this conference as a social media educator. This does not make me a better educator, but it does give me a unique perspective amongst educators. Social media has added a new dimension to educational conferences and the entire education system as well. The idea of social media for educators is simple, it connects educators. What each educator does with that connection is a personal choice. 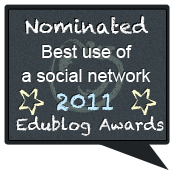 Most use it to share, and collaborate on educational information, as well as social interaction with other educators. 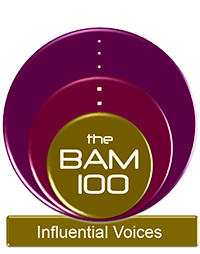 Theoretically, this keeps the participants relevant in sharing the latest and greatest in the field of education. 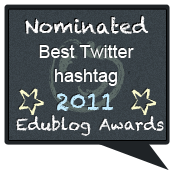 A Social Media educator is not better than a non-social media educator, but maybe a tad more relevant. Of course that would not be true if the non-social media educator kept up with educational journals, educational news, and educational trends as they came out in print. However, the expense of the printed journals and printed news sources needed to keep up, might prove cost prohibitive and too time-consuming for most educators. 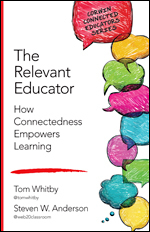 Beyond relevance, social media offers an incredible amount of connectivity to educators on a global scale. The big three, Facebook, LinkedIn, and Twitter have connected tens of thousands of teachers worldwide. There are ongoing discussions and collaboration of educational topics taking place on these platforms worldwide, 24 hours a day, transcending boundaries of time and space. The biggest obstacle for me is the acceptance and understanding of time zones since this is a global endeavour. 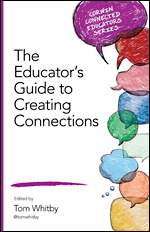 Beyond the relevance, educators come to conferences prepared to network. Throughout the year they are connected to many of the very same educators who attend these conferences. These connections add a whole new dimension to an Education Conference. Like old friends meeting after a long absence, people pick up or begin discussions already begun online. Face-to-face meetings answer curiosities of longstanding online connections. People put the .5” x .5” Twitter Profile Pic to a real face. It is an experience that a non-connected educator might only get upon bumping into a noted keynote speaker. For connected educators at a conference as large as ISTE11, we may bump into our own personal keynote speakers 50 times in one day and be thrilled each and every time. In addition to the recognition and connection factors, Social Media educators have the advantage of communicating with large numbers of people at any time to give out or request information: Who is where? What is good? Where should we eat?, Where should I go?, and my favorite, Come find me Steve Anderson, I am lost again. These were typical messages sent during the course of the four-day event. The other type of communications, going out consistently, was updating on valuable messages by presenters from their sessions. SM educators were connected in some ways to workshops and presentations even when not in attendance. Back Channeling is having a big effect on conference presentations. SM educators are in direct control over messaging the Good, the Bad, and the Ugly of each and every presentation at a conference. Tweets of praise or tweets of criticism fly from the workshops. Ideas of worth and value of presentations and presenters are not withheld. We can only hope that it is responsible, thought-out criticism, but that might not always be the case. This is the ugly side of social media that we must be aware of. I have seen great presenters labeled by some short-sighted and mean-spirited SM educators as stupid because of a simple spelling error. In the past the term “racist” was bandied about by some SM educators in regard to some #Edchat Topics. The power of social media also comes with great responsibilities. We all need to think before we speak even in digital terms. As a matter of fact, it may be even more so for digitally speaking. The spoken word will reach a determined number in the audience, while the digital word can go on forever to undetermined numbers of listeners. As I described in my previous post, this is not your Father’s EDU Conference! Social Media has provided a new level to conferencing that may have profound implications in future conferencing. It certainly has changed conferences for me and other SM educators. There will be some who will play down its effect, but there were some who played down the effect of “Talkies” in the movie industry, the effect of the steam engine in the Shipping Industry, the effect of Magnetic recording tape in the entertainment industry, and, let us not forget, the doubters of technology in the Education Industry. I had a great time at ISTE11 and I look forward to the next one. I believe my connections made me more aware, and made the conference, for me, more meaningful. I am also much more aware of my responsibility to think before I post. I believe that social media is making a difference in learning. If we make a difference in learning, we must consider making a difference in teaching. If learning is enhanced by technology, than it must be a consideration in teaching. I guess that is also the reason for a multi-million dollar International Technology in Education Conference. Technology is not the silver bullet for education, but it is also not a “should we use it, or should we leave it” decision. If social Media is working for educators as a tool for learning, why not consider it as a tool for learning for students. Why not have students build their Personal Learning Networks to connect them through their education careers. Why not enable them access to content beyond what their teachers may be able to provide. The idea of learners connecting responsibly with other learners for the purpose of sharing and collaborating may move us from where education is, to where ever it is we should be. Social Media may be a tech tool that will move that idea forward. Again, if it works for educators, why shouldn’t it work for students. We are all Learners! 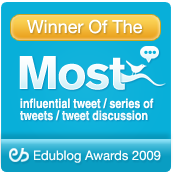 Thank you for providing a comprehensive perspective of social media in education. I am so thankful for your leadership in this field — a field that is giving voice and knowledge to so many educators and students throughout the world. Great description of how engaging with Social Media can up the engagement in other areas too! I thoroughly enjoyed reading this post and found valuable information to share. I can relate to what you’re saying because of my other social media connections: photogs and MINI Cooper owners. Through Twitter, Facebook, Flickr, and other s/m outlets, I have been able to get helpful ideas, meet new people, and socialize in person. 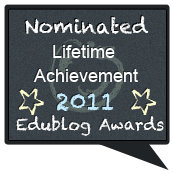 Unfortunately, it’s only just within the last few months that I’ve been exposed to more educators in the same manner. I’ve yet to attend any meetups with other teachers though. 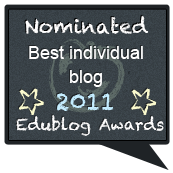 Your insightful post is the perfect follow-up to my ISTE11 experience. Just as with meeting you face-to-face, meeting and talking with so many in my Twitter PLN, brought the greatest learning moments, a comraderie of kindred spirits, and the joy of seeing so many familiar .5″ x .5″ faces. 🙂 I look forward to many more shared experiences with the social media in education crew! Thank you for your wonderful description of your experience at the conference and for your insights into using social media for all learners including students. This is an excellent summary of the place of SM in educators. All educators and parents should read it. Just posted it at http://bit.ly/jmSge8. Keep up the good work. Thanks for your comments about the value of social media, I will be presenting a workshop on PLN’s in a few weeks and this has added to my ideas, especially about meeting Twitter faces at conferences! Haven’t had that experience yet- envious! Wish we could have an ISTE in Australia! 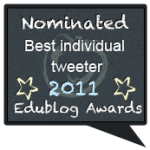 When I showed up at my first ISTE in Washington I barely knew what Twitter was. Sure I had an account and I’d been following (inactively) about a hundred or so users, but it wasn’t at the forefront of my mind. 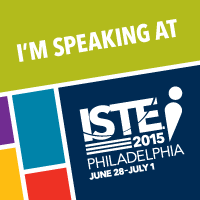 I was simply at ISTE (NECC) to get to a few sessions and hear the “important people” speak. I planned to tweet about it when I got home. About -2 hours into my conference experience I realized that I’d forgotten to bring my laptop charger with me. With no familiarity of Washington DC and no smartphone, I decided to ask my Facebook and Twitter friends for help. Within minutes I had responses from multiple people, one being Beth Still (who unofficially took me under her wing and exposed me to “this stuff”). I did, thanks to my network, find a Radio Shack and purchased an overpriced power adapter. But that distressful tweet I sent out did more for me than that… it exposed me to the power of the .5″ thumbnails I see on Twitter each and every day. It was a pleasure finally meeting you in person. Hope our paths cross again in the not-so-distant future.